Encore at Lake Grove is a tight-knit townhome community located in East Long Island, New York. Developed by well-known homebuilder, WCI Homes, Encore at Lake Grove was constructed between 2006 and 2007 and is now home to 228 beautiful townhome units, perfect for active adults looking to downsize or who desire a bit more space. 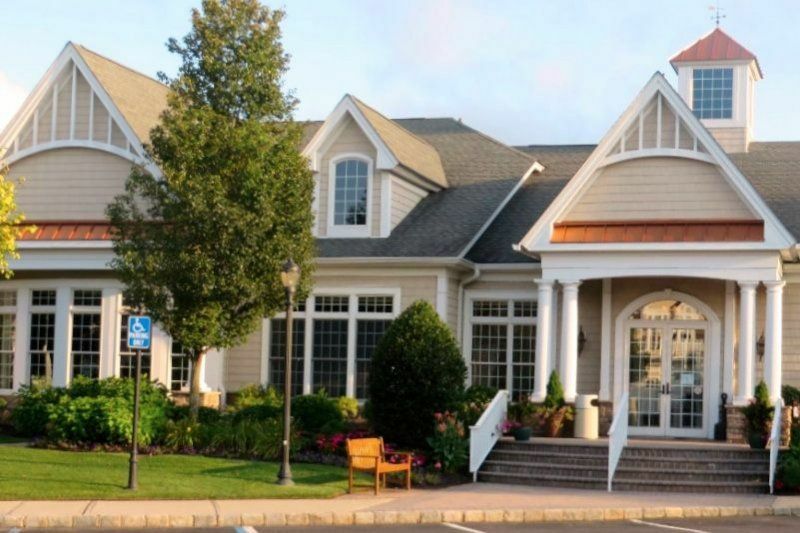 With a fully-equipped clubhouse and a long list of resident activities set within picturesque grounds, 55 and better residents in East Long Island, New York will always find a way to stay active. At the center of Encore at Lake Grove is the clubhouse, where residents can take part in social and physical activities. Stay in shape by exploring the state-of-the-art fitness center or swimming laps at the indoor pool. Meet new neighbors at an event in the grand ballroom or catch up with old friends with a favorite cocktail at the bar area. The clubhouse also features a card room, an arts and crafts studio, and a catering kitchen for community-wide events. Residents at Encore at Lake Grove can also enjoy a quick game in the billiards room or with some table tennis. The great amenities continue outdoors and provide several opportunities for enjoying the warmer months. Residents often gather around the outdoor pool and relax at the spa or on the large patio. Enjoy some friendly competition with neighbors at the bocce ball or shuffleboard courts or on one of two tennis courts. Encore at Lake Grove also offers a unique tiki bar for some summer fun while walking trails and a gazebo make for a nice quiet night with your significant other. WCI Homes built the 228 townhome units in four separate floor plans. These open floor plans have desirable features like nine-foot ceilings on the first floor, a gourmet kitchen, while some even come with an additional floor for a loft or hobby space. All homes have first-floor master suites. These modern units range in size from 1,400 to 2,189 square feet and have two bedrooms, two to two-and-a-half bathrooms, and a one or two-car garage. Most homes also have private patios. Residents at Encore at Lake Grove are continuously planning fun and exciting events to get to know each other and explore common interests. A full-time activities director is also on hand to help residents plan activities. Make staying in shape a social activity by taking the Zumba class, joining chair yoga sessions, or taking part in the tennis group. Encore at Lake Grove makes it easy to meet new friends and catch up with old ones with pizza lunches, trips to local destinations, and holiday parties held throughout the year. Common interest groups range from the Italian club to wine tastings to poker, ensuring that residents develop a deep sense of community and meaningful friendships while exploring new activities. Encore at Lake Grove is located in the East Long Island town of Lake Grove, New York. The charming seaside town of Port Jefferson is just a short drive away, one of Long Island's "Gold Coast" towns. There are also miles of beaches in nearby Fire Island and the legendary Hamptons, with their wineries, world-class restaurants, and boutique shopping, is less than 30 miles from the front gate. Just outside the gate at Encore at Lake Grove is the Lake Grove Commons that has grocery stores, a brewery, and a home improvement store. Smithhaven Mall also has a Whole Foods and a Trader Joe's. Lake Grove is also close to over a dozen golf courses, ensuring that the next swing is always close at hand. Encore at Lake Grove is also conveniently located just down the street from Highway 25 and 347 and is less than ten miles from the Long Island MacArthur Airport. For longer excursions, JFK International Airport is approximately 50 miles away and, just a little farther, is New York City's collection of wonderful activities. Active adults in East Long Island, New York will love the breathtaking scenery, convenient location, and beautiful homes at Encore at Lake Grove.